Famously, you had two hits before dying. When you drop to your undies, you're in trouble. 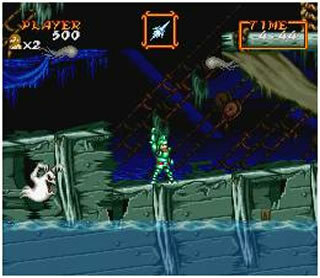 Super Ghouls ‘n Ghosts was a side-scrolling platform game released for the S NE S by Capcom in 1991. It was an incredibly difficult game which cast the player in the role of a Knight called Arthur (King Arthur of round table fame) trying to rescue his kidnapped love from the ghoul realm which was packed with nasty ghouls and ghosts. The game-play was unforgiving but deeply addictive, the graphics were colourfully charming and the soundtrack was extremely memorable. 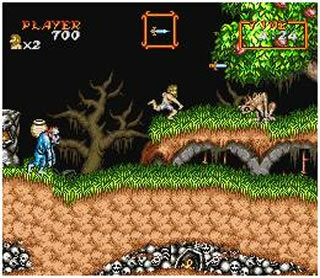 Super Ghouls ‘n Ghosts was the third and final game in a series which began in the arcades with Ghosts ‘n Goblins. It was followed by Ghouls ‘n Ghosts which was a big hit on the S ega Mega Drive and since Nintendo was locked in battle with S ega they released Super Ghouls ‘n Ghosts to attract fans of the series away. This was a terrific game which claimed countless hours of my life. As Arthur you began in basic armour but you could upgrade as you played through. Amusingly you could also go the other way and if you took a hit while in your basic armour you would be left in your pants. You could also upgrade to magic green armour which enhanced your attacks, and the ultimate magic golden armour. Getting any sort of armour would be very, very tricky! You would guide Arthur through each screen hacking and slashing your opponents along the way, you could also double jump, which allowed for changes of direction in mid air, you could fire a bow and arrow and you could gain various magical attacks as you progressed. Much of the frustrating difficulty of the game actually came from jumping between platforms and the irritation of reaching the end of a level in just your pants having despatched countless enemies only to miss the moving raft and plunge to a watery death was unparalleled, especially when you consider it meant replaying the entire level again from the start. Arthur faced a multitude of enemies on his adventure who required different amounts of damage to kill and moved and attacked in a variety of ways. Your basic grunts were the zombies, there were also flaming skulls, werewolves, clams with eyes in them, spiky blobs, ghosts, spiky fish, sea dragons, winged demons, bats, goblins, giant centipedes, a hydra, evil knights, S ardius and even S atan himself. That’s by no means an exhaustive list of the enemies you had to face and the variety and imagination on display was a great facet of this title. Arthur could also find various pick ups on his travels and choose between weapons with different rates of fire and damage. From throwing axes and knives to sickles and lances lots of goodies could be found in the chests littered throughout the game however you had to be careful as chests could also contain enemies, most worryingly the Jester who had the power to turn you into a helpless baby for a few terrifying seconds. In order to complete the game you had to battle your way through eight beautifully crafted levels. The first level featured the graveyards and the abandoned island, for level two you took to the sea with the ghostly ship wrecks and then the intensely frustrating rafts across the oceans. If you made it this far, which few people did, you began to descend into the volcano mines and would eventually reach the lair of S ardius via a system of caves and a frozen wasteland . Graphically the levels looked great and featured moving elements like fire and snow falling. The sound was also excellent for the time; it was like an orchestral remix of the original theme tune and formed the perfect gothic accompaniment to the game. It really added something to the chilling ghostly atmosphere and would often get wedged in my head after a gaming session. Super Ghouls ‘n Ghosts was a fantastic game but make no mistake it was really tough and there was no mid level saving and no recharging health bar. While this made it a frustrating experience in places it also meant that completing the game was an achievement to be savoured and celebrated. Your reward for battling your way through this epic adventure was to be re-united with your princess and ride off into the sunset. It seems unlikely that many modern gamers would have the patience or determination necessary to defeat a game like this because there are simply no games as unforgiving or difficult as this released nowadays .